New York City: The ICHA’s 21st annual City Council Speaker’s Cup featured the top 1-Wall small players in the world battling for one of the sport’s most prestigious titles. Tyree Bastidas entered the event as the top seed and current 1-Wal small ball national champion, but was ousted by WPH R48 IV breakout star Mike Schneider in the semifinals, 25-21. “Both Mike and Tyree were using off-speed cuts and powerful drives to keep each other off balance,” stated WPH reporter James Flaherty. “In the end, Mike was able to win the big points and advance to the finals in one of his biggest 1-Wall small ball wins. The bottom half of the draw featured thirty-something stars Cesar Sala, Joe Kaplan and Willie Polanco, as well as all-around star Billy O’Donnell battling for a spot in the final. O’Donnell defeated Sala in the bottom quarterfinal to setup a match with 2011 WPH 1-Wall small ball Fireball champion Willie Polanco. Polanco played the angles and mixed in strong “out the door serves” to overcome “The Bus,” 25-19. The singles final was anticlimactic, as Polanco built a 15-1 lead on Schneider before Schneider was forced to withdraw with a bad knee. Sandy Ng continued her stellar 1-Wall play, dominating the women’s singles with victories over Jessenia Garate and Annie Huang to add the Speaker’s Cup title to her 1-Wall big ball national singles title from two weeks ago. Victor Lopierre and Cesar Sala claimed the men’s doubles title, outlasting Cinderella Story Isaac Acosta and Michael Zhou. Thank you to WPH reporter James Flaherty for the updates! 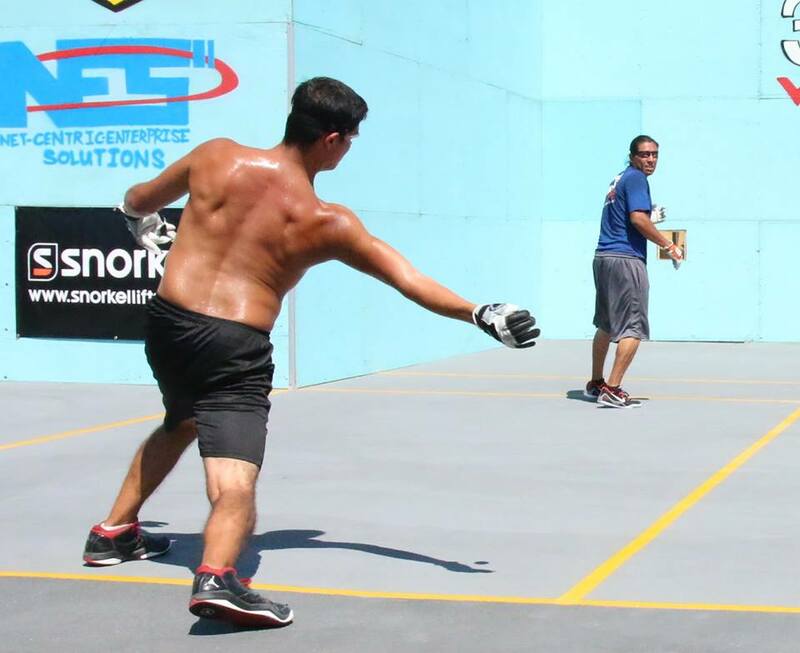 Chicago, IL: The 26th Annual LaGrange 3-Wall Tournament featured the return of 2014 WPH 3WallBall small ball singles champion Nik Nahorniak for the first time since undergoing knee surgery in the spring. Nahorniak dominated the field, defeating Anthony Sullivan, Michael Dorneker and Dane Szatkowski en route to the title. Nahorniak slammed by winning the doubles with partner Bill Mehilos, defeating Team Szatkowski in two games in the final. In the USHA 3-Wall Junior Nationals held in conjunction with the 26th Annual LaGrange 3-Wall Tournament, El Paso’s Juan Canales defeated Canada’s Michael Gaulton to win the 19-and-under and Denver’s Jon Gutierrez defeated Joe Coman to win the 15-and-under. Read more at www.ushandball.org. Tecate, MX: Brian Medina entered the WPH Outdoor Baja Blowout Stop #3 seeded outside of the top six, but advanced to the final in the draw’s top half. Victor Martinez advanced to his second consecutive Mexico Cup final, defeating second-seeded Sal Duenas in the bottom bracket semifinals. Medina continued his magical run in Mexico, defeating Martinez in the final. Stay tuned to wphlive.tv for more details on the Baja Blowout.